A Team Approach | Highfields, Inc. Thanks to you, Kathy has a team to lean on. Kathy describes a chaotic year she went through with her family, specifically her 17-year-old daughter, Alycia. Alycia is cognitively impaired. She never had special services growing up except Early On, which assists families with children under the age of 3 who have developmental delays and/or disabilities. It wasn’t until 2014 that everything changed. Alycia went through a traumatic experience in her family that affected her in so many ways. She struggled with psychotic episodes, depression, aggressiveness and was in and out of the hospital multiple times. Kathy struggled to keep everything together. She was referred to Highfields through LifeWays Community Mental Health and was able to obtain a Serious Emotional Disturbance Waiver (SEDW) for Alycia. A SEDW opens the door to home and community-based services for children with serious emotional disturbances who are at risk of hospitalization. 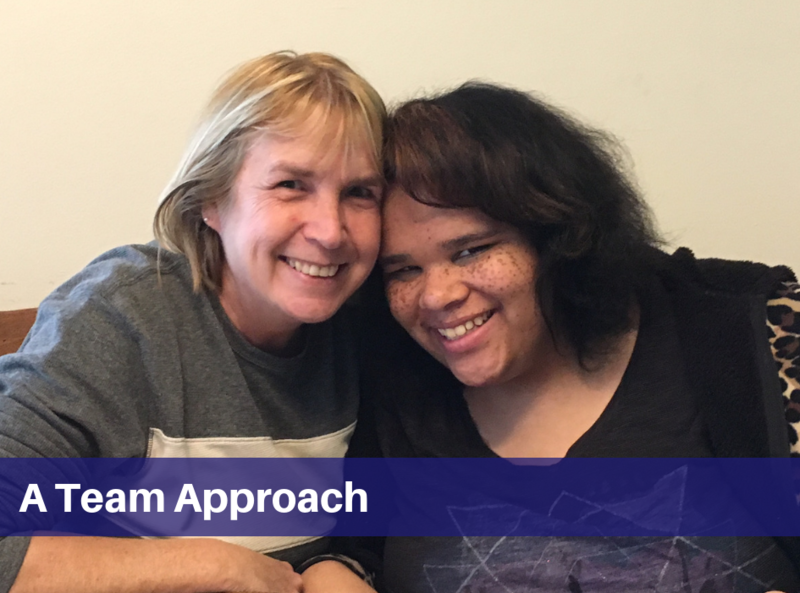 Kathy finally had access to a supportive team through Highfields’ Wraparound Program. “It lifted some of the burden of feeling like I had to handle it alone,” she said. Her Family Team consists of two Highfields’ counselors and two professionals from other organizations. The team meets with Kathy every week and they determine the best ways to help Alycia overcome trauma and cope with her special needs. They also find solutions to help Kathy find relief and practice self-care. One of the first programs they set up was respite care, which provides short-term breaks for caregivers. Alycia is able to go to respite homes for a few hours or sometimes overnight, so Kathy and her other children have a break from what can be an intense household. They set up a program for Alycia to go out into the community with supervision and learn life skills, like how to handle money and how to shop for groceries. They also recommended occupational therapy to help Alycia with her school and social skills, and speech therapy to help with her hearing impairment. These services help the team better understand how Alycia processes things in her mind. Thanks to donated camperships, Alycia even attended camp for the first time! She made friends, had dance parties, and can’t want to go back again. Next year, Alycia will turn 18 and won’t be eligible for as many services. Kathy is working with her team to come up with options that are best for Alycia.